MEDDIC Academy was built to make high-end Enterprise Sales Education accessible to all. At any time, from the comfort of your office or home, you can enroll and learn MEDDIC. No need to wait for the next year kick off or even your company’s planned sales training session. 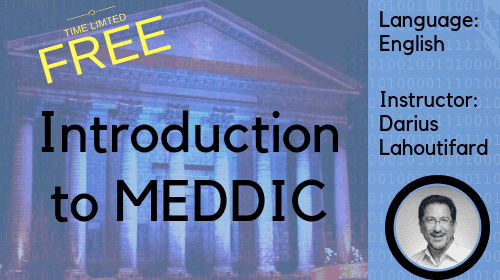 Therefore, to help you get started easy and fast, we are offering “Introduction to MEDDIC” course for free for a limited time. Get on board now, analyze this quarter’s deals with the right methodology and close them. This is the starter course! Attending this course will allow you get familiar with our methods and style, before deciding to pay. That’s why we are offering this first course for free, for a limited time. ENROLL HERE NOW FOR FREE!